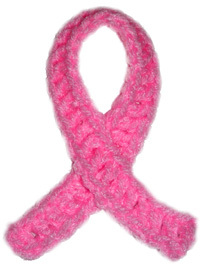 If you are looking to spread awareness about breast cancer, here is a very fast and easy ribbon that you can crochet. You can use it as a pin or sew it to clothing or blankets as you desire. Row 1: ch 37, dc in the back ridge only in third ch from hook and in each ch across, finish off. Using the photo as a guide, sew or pin the ribbon together. If you need help crocheting the breast cancer awareness ribbon, let me know and I’ll be sure to help! This entry was posted on Wednesday, October 28th, 2009 at 5:44 AM by Rachel Choi	and is filed under Free Crochet Patterns. You can follow any responses to this entry through the RSS 2.0 feed. You can leave a response, or trackback from your own site. Where is the Back Ridge of a Chain in Crochet? What a creative way to wear a ribbon, I love this. I know someone who was looking for a way to add breast cancer ribbons to crocheted beanies, I’ll be sure and pass this on. This is great! My school is having Pink Day for breast cancerbon Friday and I’m going to make these for all the teachers who’ve had breast cancer.Only thing is, I dont’t have pink so I’ll use either red or white…….Thanks for the easy and free pattern! Thanks for the pattern, Rachel! What a great idea! I recently received a pink ribbon in a store (since it was October) and I pinned it onto a jacket of mine (a jacket that has lots of bling!). But I think I will replace the ribbon with this crocheted one. Might even make it in other colors, too, like red. Thanks! I tried this pattern using only 30 stitches in the chain for a little bit smaller ribbons. Thanks for posting this! thank you rachel. this is just what i was looking for. a childhood friend suffering from pulmonary fibrosis is in pittsburgh awaiting her lung transplant. this ribbon (in pale purple) will be a perfect “thank you” for a donation into the fish bowl at her benefit on 11-20. i will easily make 100 by then. How about the red/blue for CHD awarness in Feb? Love this! Mine is going to be Gold for Childhood Cancer. Will be selling and sending money to St. Jude!! love this ribbon the only thing I have a question about is how to sew it together. I made one in orange and can’t seem to understand how to sew it together or attach it onto a project. Many craft shops have pin backs that have a way to sew them on. there are small holes in the bar part. I have used these many times and are not very expensive. sometimes the craft stores, if they know you are donating or just giving the handmade items away, will give you a bag of the pin backs for free. My brother has just been diagnosed with pancreatic cancer – I will be making purple ribbons for our family members. Thank you! My sister was DX yesterday with a very rare form of breast cancer. Less than 1% of women get this type of cancer. Next Thursday, they Will do a mastectomy. I am making these for my other sisters, brother, and family to wear that day to show our support! Thanks for the pattern! I’m part of Charity Crochet Exchange on Facebook. This month we’re making afghan squares with ribbons for different types of cancer we or others we know have experienced. Our chair will assemble the squares into afghans for Hope Lodge in Iowa. Thanks for the patterns, and the many others I’ve used over the years. Yours is the first crochet website I ever used.